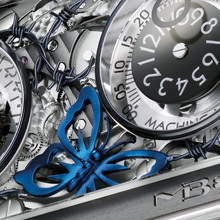 There is a butterfly trapped in the movement of the latest watch to emerge from MB&F (Maximilian Büsser & Friends). And it has no hope of escaping, because the complicated movement is wrapped in barbed wire. This emotionally charged piece, a one-of-a-kind interpretation of MB&F’s Horological Machine No2, is signed by the American artist Sage Vaughn. It will be auctioned at Only Watch, the charity auction to benefit research into Duchenne Muscular Dystrophy to be held in Monaco on 24 September 2009 under the patronage of HSH Prince Albert II. The auction is held every two years and brings together the cream of Switzerland’s haute horlogerie watchmakers. Each contributes a unique watch, or the number one from a limited series, to be auctioned without a reserve price. All the proceeds from Only Watch go to enabling the Monegasque Association against Duchenne Muscular Dystrophy (AMM) to support international research projects into that disease – a field in which the Association has been actively involved since 2005. Duchenne Muscular Dystrophy is a serious genetic disorder that affects one in every 3,500 boys. It is characterised by a progressive weakening of the muscles, resulting in respiratory and cardiac problems that become fatal as the child gets older. In Europe there are around 30,000 sufferers of the disease. As yet there is no cure for the disease, but considerable progress is being made. One of the most important breakthroughs is the development of Saut d’Exon – a surgical technique that enables the cellular machinery to “forget” to read that part of the gene that carries the abnormality of the illness. This technique was developed by Luis Garcia, Head of Research at CNRS, and his team. Mr Garcia is a key player in the field of Duchenne Muscular Dystrophy. He and his group are among the 20 research teams that have benefited from AMM’s financial support. Maximilian Büsser knew that he would participate the moment he spoke to Luc Pettavino, the President of AMM. “At my age,” he says, (he is 42), “if I contract a serious illness I can say that I have already lived a full life, but for a child just starting out, it is a tragedy”. Whilst he would never claim to understand the suffering of a child with this disease, childhood holds a special importance for him. For all their sophistication, the lovingly crafted time machines that he dreams up and creates with his Friends have their roots in his earliest years. The case of Horological Machine No2 is the most complex case in the history of watchmaking, but its modular structure is inspired by the meccano model kits that were his toys. The 22-karat gold automatic rotor has the jewel-like hand-finish reserved for the elite of traditional watch movements, but it owes its iconic sickle shape to the double-headed battleaxe wielded by his childhood comic hero, Grendizer. All the great sci-fi TV series – Star Trek, Thunderbird, Dr Who and Star Wars – have played a role in MB&F’s creations. It is the tension between fascination with that imaginary world and a love of high-end horology at its purest that gives the machines their vitality. Büsser and his team were, as he says, “shocked into” creating a piece of horology for the Only Watch event, and were determined that their timepiece should convey that emotion. But horology has its limits. How could it be used to express the beauty and vulnerability of childhood, and the valiant struggle of a child who may well be in a wheelchair before he is twelve? There are no coincidences in life, and at the time, a new gallery in Geneva was given over entirely to the work of Sage Vaughn, an American painter and former graffiti artist whose solo show in New York last summer had been one of the art world’s most talked-about events. This young artist has fought and conquered his own demon – a seven-year heroin addiction – and the pain of that struggle is felt in the emotional power of his work. The images of gaily-dressed children or bright birds or butterflies putting on a brave front against bleak urban backgrounds had haunted Max Büsser. He had bought one of the art works, a baseball bat adorned with a collage of butterflies, pinned down by nails. Here was the tension between light-hearted innocence and something darker that he was seeking. A trip to the US proved him right. Sage Vaughn understood the mission at once and immediately proposed to donate his time and talent. Max Büsser came back with the initial sketch for the watch, and the result is faithful to it. The entire upper face of the watch – the surface of the rectangular case and the two projecting portholes – is crafted in sapphire crystal, revealing the HM2’s complex engine. The hundreds of minute components display the meticulous hand finish that is MB&F’s hallmark. But they are imprisoned in barbed wire. A blue butterfly struggles to escape from the same fate, but its wings are clipped. In the finished work, the barbed wire is handcrafted in blackened gold and the butterfly in blued gold. But the scene has all the emotional power of the first rough by Sage Vaughn – a pencil sketch of the movement criss-crossed by barbed wire drawn in red pencil. The watch is a unique interpretation of Horological Machine No2, launched as limited series in 2008. HM2 typifies the radical approach to high-end horology taken by Max Büsser and his Friends. It is a high-tech time machine of the twenty-first century and an incredibly sophisticated micromechanical work of art. It houses the world’s first mechanical movement – “engine” in MB&F language – to offer an instantaneous jumping hour, concentric retrograde minutes, retrograde date hand, a bi-hemisphere moon phase and automatic winding. The case alone contains more than 100 parts – more than many complete movements – and is the most complex case in watchmaking history. Altogether the watch has over 450 components. Sage Vaughn was born in Jackson, Oregon in 1976 and grew up in Reseda, California. He now lives and works in Los Angeles. As a child he developed his talent for art in the company of his father, the artist Richard Smitty Vaughn Junior. His father would take him to the Los Angeles zoo, where they would sit all day, sketching the animals. His hippie parents had little money for toys, but they encouraged him to draw and to develop his own style. Later, he became an avid participant in the graffiti culture. 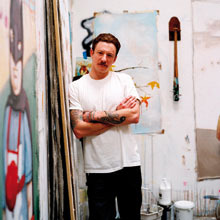 Today he favours painting, but the city of his graffiti days is ever present in his work. It is shown in its least flattering light, in the grey walls and stylised cityscapes and freeways that form an austere backdrop to his vibrant foreground figures. He has also preserved the same free and easy touch and energy. This is most visible in the paint runs used in certain areas of his work. Sage Vaughn’s paintings question the human condition and the difficulty of living in a contemporary environment. The bright birds and insects serve as an affirmation of life, but they also remind us of our strategies for survival in a modern society. Imperceptible at first glance, black tattoos in the birds’ plumage spell out the names of gangs or codes. They evoke the individual’s need for recognition, but also a subculture, linked in the collective conscience to violence and rebellion in the streets. Sometimes, children replace the birds in the foreground. Not yet formatted by society, they seem to have the energy to survive and reinvent the world. Sporting masks and brightly coloured costumes, they look like superheroes. Yet there is nothing joyous or innocent about them. Each is desperately alone, abandoned in a hostile setting. The message could thus be seen as a bitter one: the American dream of bucolic happiness is shattered. Sage Vaughn likes to cloud the issue, however, and scramble what might be seen as clear cut. His paintings do not stop at that admission of failure. To live is, of course, difficult but the simple fact of being alive brings hope. In the wake of Melville, whose novels the painter admires, Vaughn knows that even during war, birds do continue to sing and children to play. The founder of MB&F says that he created a business model around his neurosis. He was an only child who grew up longing to surround himself with people that he could admire. His parents – his father Swiss, his mother Indian – were “too much in love” to provide the company that he craved, and, left to himself, he developed a rich imaginary life. This led to constant injunctions, at home and at school, to be more reasonable and responsible, and the little boy grew up imbued with his father’s rigorous principles and sense of duty. It was only when his father passed away, seven years ago, that he felt free to become unreasonable again. “There are two occasions when you become conscious of mortality”, he says. 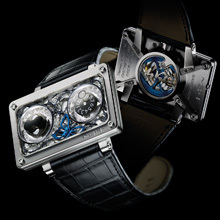 “When you have a child, and when a parent dies.” That prompted him to leave what he admits was a dream job, as head of Harry Winston Timepieces, and form MB&F (Maximilian Büsser and Friends), a company dedicated solely to designing and crafting small series of radical concept watches in collaboration with talented professionals. Or, as he says: “Letting my guts speak instead of my head”. That spirit is shared by all the independent craftsmen, engineers and watchmakers who collaborate on his projects. Jean-Marc Wiederrecht/Agenhor designed functionality regulated and powered by a Girard-Perregaux oscillator and gear train. Blackened 18K gold barbed wire which imprisons the movement, symbol of the illness capturing the body. Blued 18K butterfly on movement bridge, symbol of innocence and childhood. Dial side with anti-reflective treatment on both faces. Display back signed by Sage Vaughn. Brushed sapphire for minutes and date, Black disks for hours and moon phase. Black hand-stitched alligator with 18K gold and titanium custom designed deployment buckle. Sage Vaughn piece unique painted wooden “coffret”.